I live in half of a newly built duplex on top of what may be the highest hill in Mwanza, Tanzania. I travel on foot and ride the daladalas (mini-vans) and pikipikis (motorcycle taxis) to get to the school where I teach. There is no paved road, but there are some slightly worn paths winding through the huge rocks. Every day is an “off-roading” experience, as we careen up and down the roughest terrain of Mwanza. After 20 minutes, I reach the paved road at the bottom of the hill and find my way to Shaloom (pronounced “Shalom”) Kindergarten. No matter how early in the morning I arrive, 13 students, all of whom are impoverished and many orphaned, run to the gate to meet me and begin their school day. I have given up on setting up the classroom early! Instead, we enter together and, as is the local custom, slip off our shoes—theirs mostly broken—and line them up by the door. Then the children swing their feet as they sit on the classroom benches. 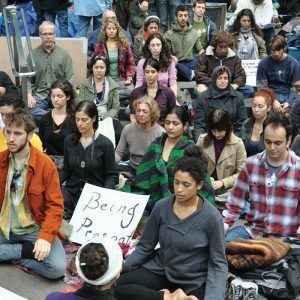 I lead a spontaneous prayer, which Christians and Muslims echo alike. My Kiswahili grammar is rough, but the children valiantly sense the deeper meaning, or at least go with the flow. Then, one by one, I call them to choose a puzzle, a set of blocks or cards, a book, or such, to enjoy in the first hour. Kindergartners are mesmerized by the lessons of Susana Carpenter, who worked as a teacher in California for 20 years before joining Maryknoll Lay Missioners in 2014. I am blessed to employ two Mwanzan women. Rehema is my co-teacher. Though her education was scant, her talents are great. She begins by guiding the children in their play. Mama Jerad, the mother of one of our students, recently began to cook and clean for us. She is deaf and her life has been very difficult. Thankfully, we were able to offer her a job. She cleans vigorously and well. She is learning the rhythm of boiling plenty of water to purify for drinking each morning, and preparing the children’s food and beverages. Rehema and I enjoy leading the children through two or three lessons each day—focusing on reading, writing and arithmetic. Thanks to the Dominican Sisters and others from whom I learned teaching skills, I have much to draw on in preparing our lessons. Rehema adds her motherly wisdom and seasoned insight. 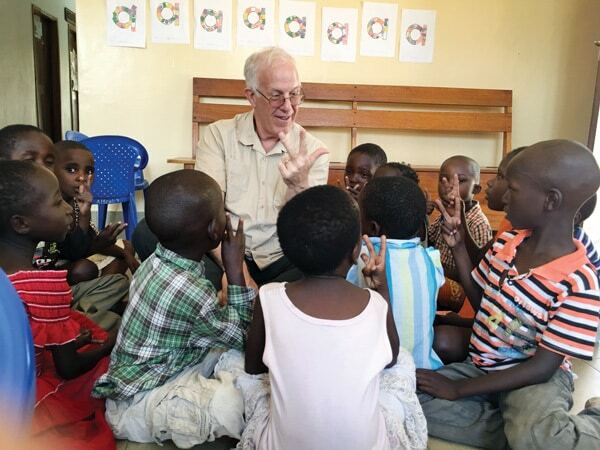 While visiting Shaloom Kindergarten, Maryknoll Lay Missioner Sam Stanton helps students practice counting numbers, a skill that will prepare them for first grade. The day includes song, dance, outdoor games, and time for drawing and painting. Sometimes when outdoors, the children spontaneously gather together. One will perch on a rock and begin a lively chant. The others will respond. When the chant is about a lion chasing other animals, many of the children will run at top speed with one or two designated “lions” trying to capture them! When I listen, I feel as if I am hearing songs that are hundreds of years old, and can almost feel the drumbeats beneath the rhythm. At the end of the school day, Rehema and I usually walk to the daladalas together, discussing the students and what they may need. At times, a quiet girl, Zainabu, stays in the classroom a little longer than the rest. “I am hungry,” she whispers. Her voice is so soft that I must put my ear to her lips to hear. Both her parents died. She is bone-thin. Occasionally, we have been able to send her home with a bag of rice. A lively boy, Mikaeli, withdraws from the rest and sits and cries. He, too, is very thin. “He is probably hungry,” Rehema tells me. “There is likely trouble in his house.” We have sent him home with rice as well. Another child sits scratching his badly wounded skin. His eyes drift away from the chalkboard. Like most of our children’s parents or guardians, his mother can afford neither doctor nor medicine. We have been able to help him through his health crisis. Under a photo of the late Julius Nyerere, first president of Tanzania, Rehema (left) and Carpenter discuss the needs of their students, all of whom are impoverished. 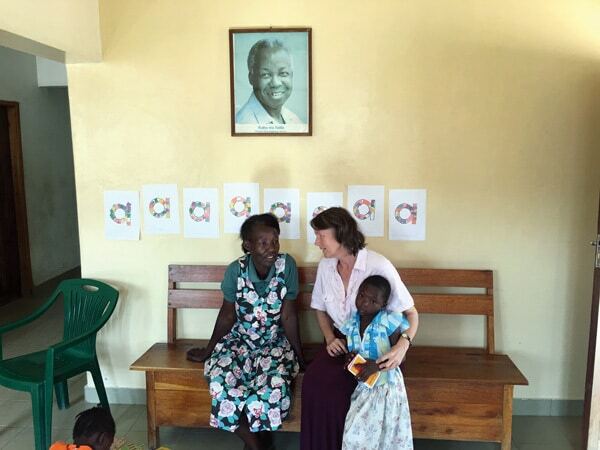 Malaria is a constant problem for the people of Mwanza, as are a few other illnesses. For impoverished parents and caretakers, such as ours at Shaloom Kindergarten, medical costs are impossibly high. Children frequently die. We have quietly provided medical care for many of our students. More medical needs will arise each month. We hope to continue this service. The gifts we receive from friends and family in the United States allow us to purchase learning materials, art supplies, balls and jump ropes, chalk and chalkboards. We hired a plumber to bring running water to the kitchen sink. We’ve bought gas and necessities so we can cook. We have replaced broken windowpanes, window locks and hinges so we will no longer get flooded in the heavy rains. 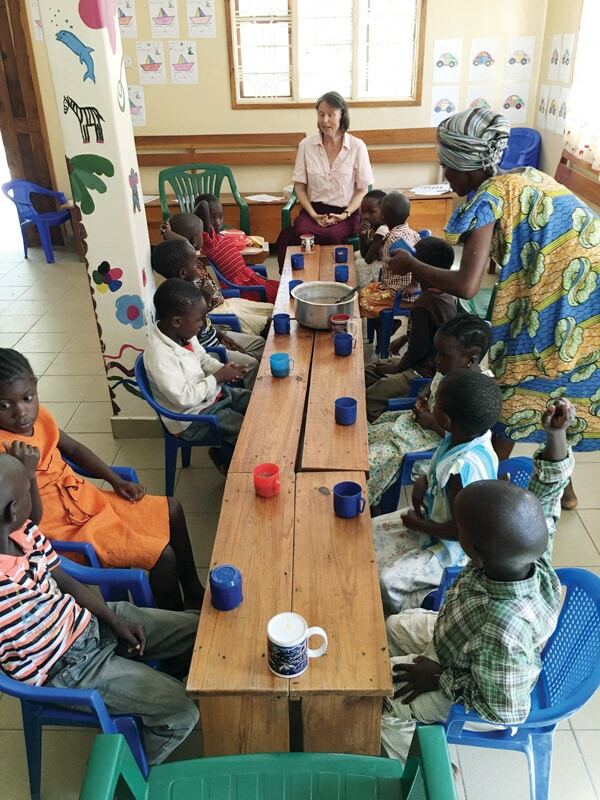 We provide nutritional food every day for the children: fruit, porridge, and an egg or muffin, along with clean water. Never has one crumb remained on a plate! These children, like those who raise them, are hungry. Carpenter helps students get settled as they prepare to eat a nutritious lunch, provided by the school and served by Mama Jerad, mother of one of the students. We have provided medical care as needed, and salaries for Rehema and Mama Jerad, which enable them to buy food for their families and ensure that their children can attend school. We are hopeful we can continue Shaloom Kindergarten. This is the school’s eighth year, and local parents are very grateful for it. Our current group will enter first grade next year in broken-down schools with 50–100 classmates in each room, no books and no supplies. In those conditions, many children, perhaps even half, will not learn even the basics. Yet, after a good kindergarten foundation where they learn to read, write and calculate, our Shaloom Kindergarten children enter first grade with strengths. What a joy it is when we often hear how well the Shaloom children do in their continuing years. Featured Image: Maryknoll Lay Missioner Susana Carpenter gives hugs at Shaloom Kindergarten while her co-teacher, Rehema, helps with a puzzle. 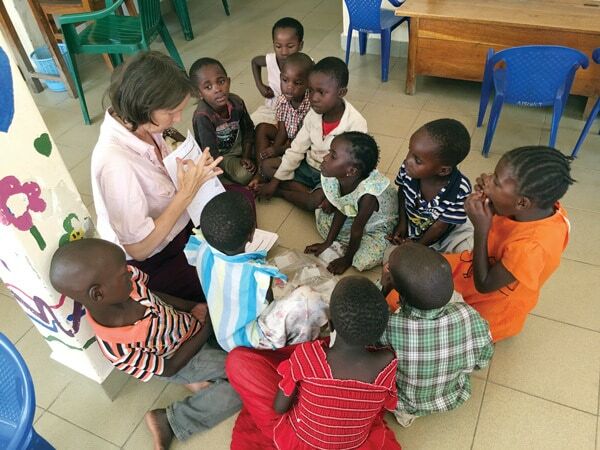 Maryknoll Lay Missioner Susana Carpenter from San Francisco, Calif., is director of Shaloom Kindergarten, in Mwanza, Tanzania, providing a loving learning environment for children whose parents died or have serious illnesses.